You guys! I’m killing this healthy eating thang!! In doing so, I also realize how much I eat rice. I’m a Latina, okay? It’s what we do. This recipe is another workday/kid/mama’s-gonna-lose-her-ish-friendly recipe. 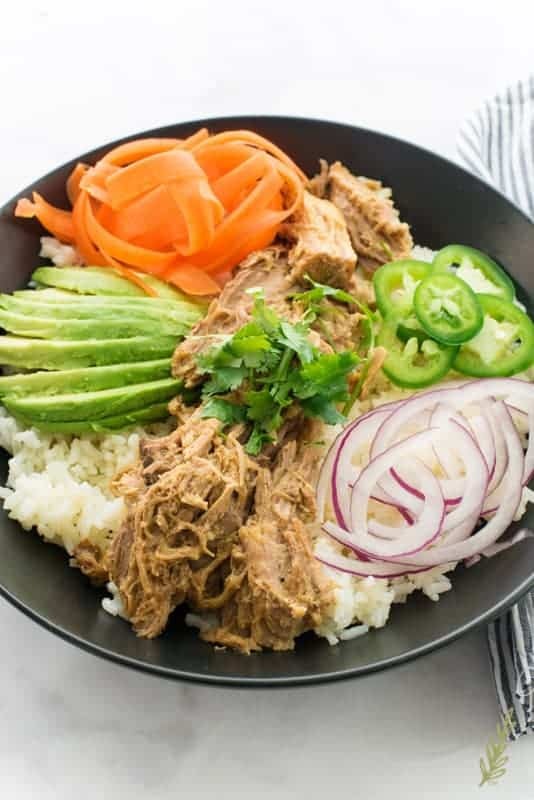 Slow Cooker Pulled Pork in Mojo Sauce is a mouthful, but seeing as how mouthfuls are good around here, it’s also fitting. Because this recipe is a chameleon, I’d advise you to make the full amount. Leftovers are a major thing over here- especially with our powers that be (AKA the gov’ment) acting like fools. 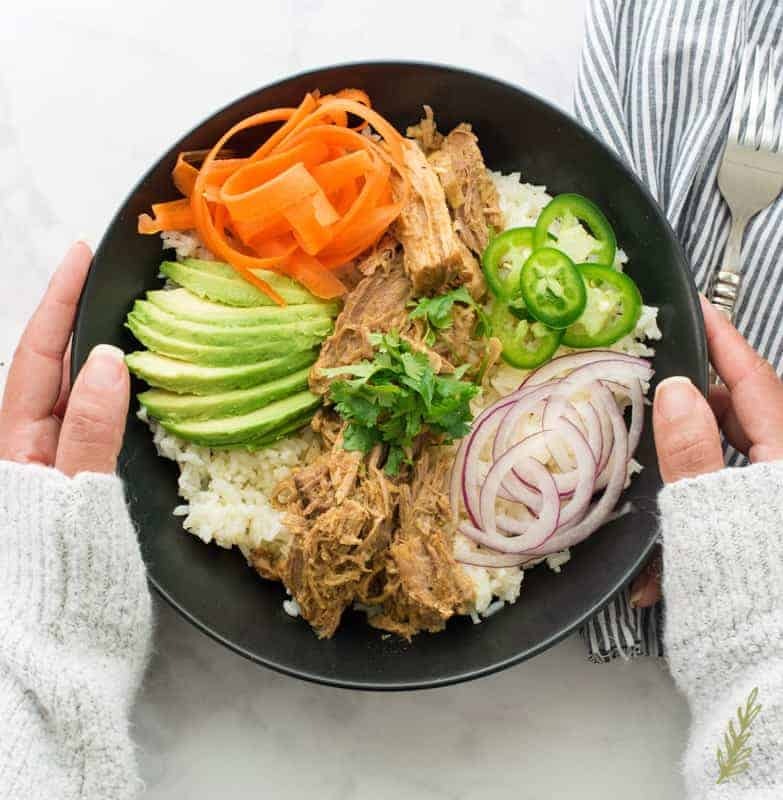 This Slow Cooker Pulled Pork can be used to top all sorts of grains (or cauliflower wants to be a grain); but it can also be used to top nachos, to fill tacos, or on its own with veggies to bulk it up. I’m all about versatility around here. Some of the ingredients used in this recipe may require a trip to the supermarket. That’s okay, because you should have them in your pantry if you and I going to move forward in this relationship. I’ll go into more detail about what they are, and where to find them, a little later. 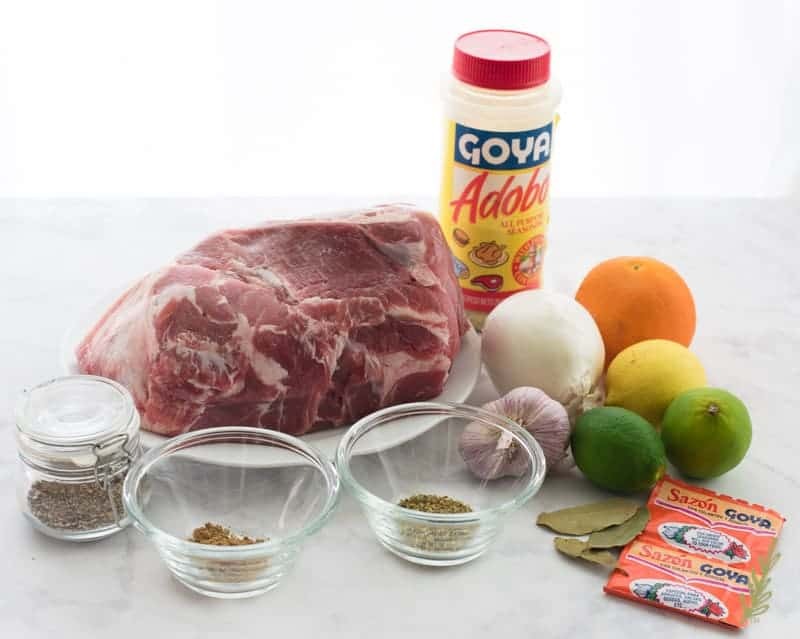 For your mise en place, you’ll need: Adobo seasoning, Sazón con Culantro y Achiote, one large orange, a big lemon, two limes, dried oregano and bay leaves, ground cumin, black pepper, fresh garlic and onion, and a five to six pound pork shoulder- bone-in! 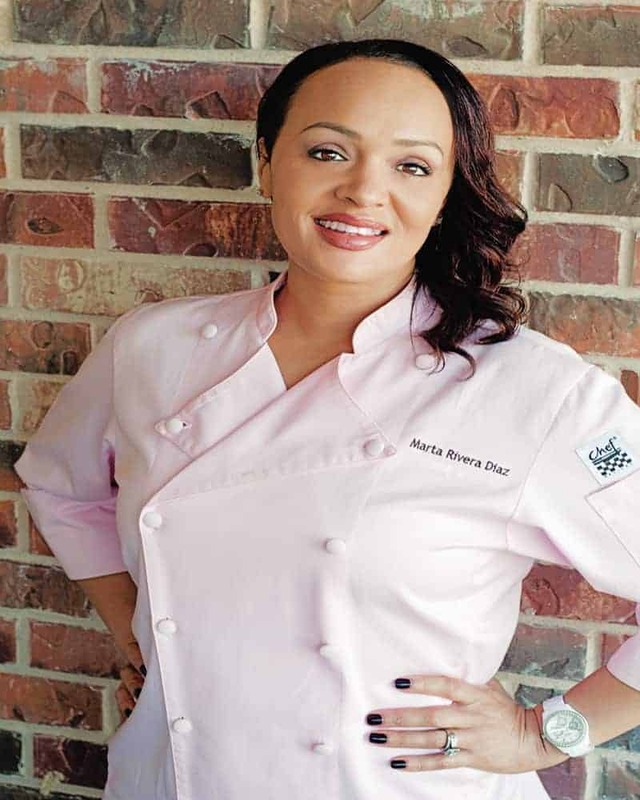 Bone in is important here, because we want to get all of the flavor from the marrow of that bone to seep into the meat, as well as into the juice the meat is cooking in. Strategy, my friend. Stra-TE-gy! Sazón is, in a nutshell, MSG. Yes, yes, I know, “MSG is soooooo bad! !” But, is it really? I mean, is it really? 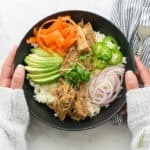 Some guy back in the late sixties claims that the MSG he ingested at his local Chinese restaurant caused his heart palpitations. From there, everyone and their mother claimed that MSG caused everything from eye problems to strokes. But where’s the medical evidence to support all of this? There must be something right? Wrong! Back in nineteen fifty-seven, lab studies of rats found that HUGE doses of MSG injected into infant rats caused retinal and nuerological damage. More recently, in the late two thousand, two, out of twenty-one, cases of lab primates were found to have developed nuerotoxicity after the oral consumption of MSG- again, a massive dose of MSG was administered. In all of this research, nothing was mentioned about the effects on humans after having ingested small amounts of the stuff. Once again, unfounded hysteria attempts to deprive us of something makes food taste damn good. I won’t stand for it another moment! I mean, not that I haven’t been using MSG since I was ten. In addition to MSG, sazón con culantro y achiote (with culantro- Mexican coriander- and annatto) also contains culantro and annatto- I totally just translated that. The former is a more pungent relative of cilantro and the latter is a small seed which gives food a bright orange color. The seasoning- which is what the word sazón means- also contains garlic and cumin. Can you make it yourself and omit the MSG? Probably; probably not. I’ve yet to see ground culantro in my travels around the world, and the truth is, it’s the MSG that makes it. So, just buy it. 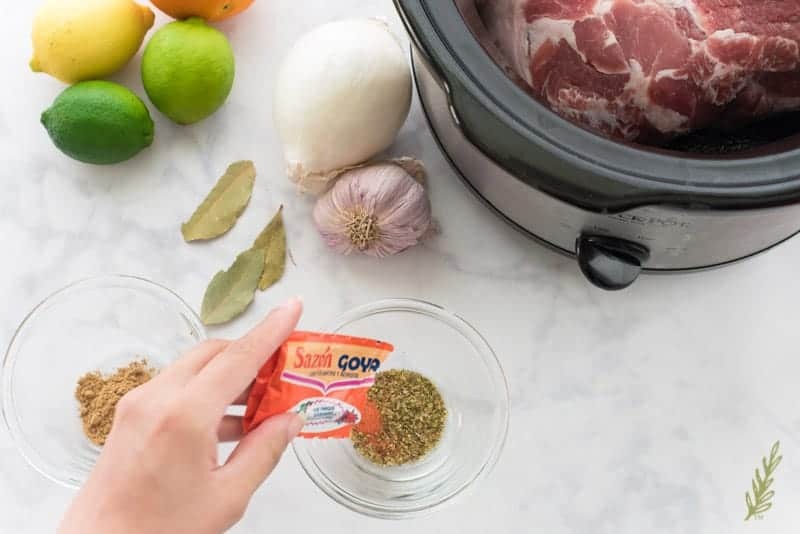 After you do, in a small prep bowl, make a spice blend starting with the dried oregano and the sazón. 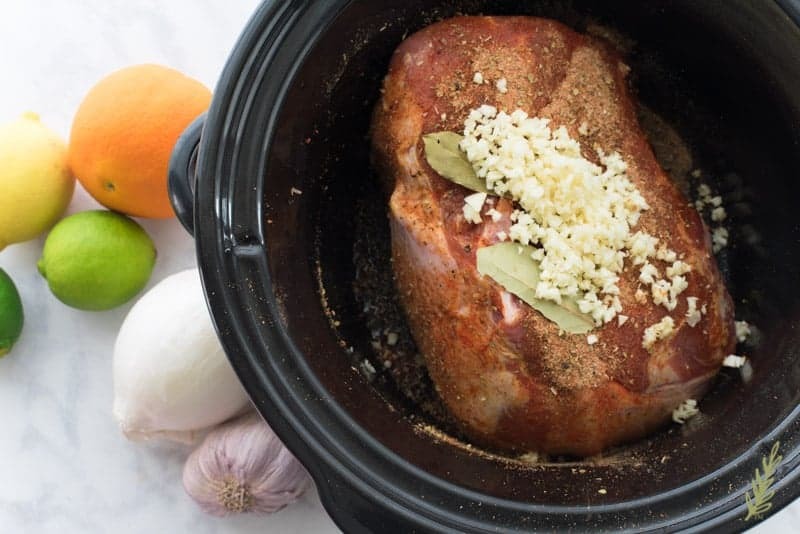 Add the ground cumin, which gives the slow cooker pulled pork an unbeatable hint of smokiness. Add Adobo– another staple of the Caribbean spice rack. 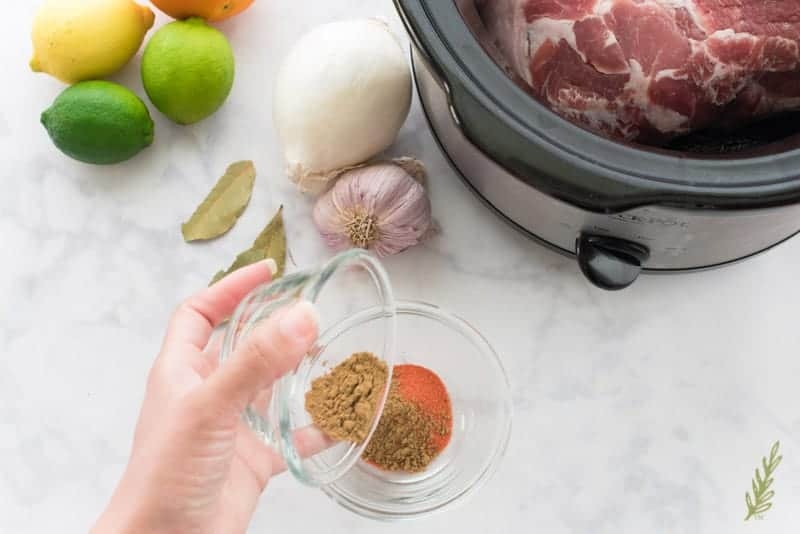 Not to be confused with the Filipino dish of the same name, this all-purpose Caribbean seasoning is made of salt, black pepper, granulated garlic, oregano, turmeric (for a bit of color), and an anti-caking agent. It’s the season-all of the Hispanic kitchen, is what it is. 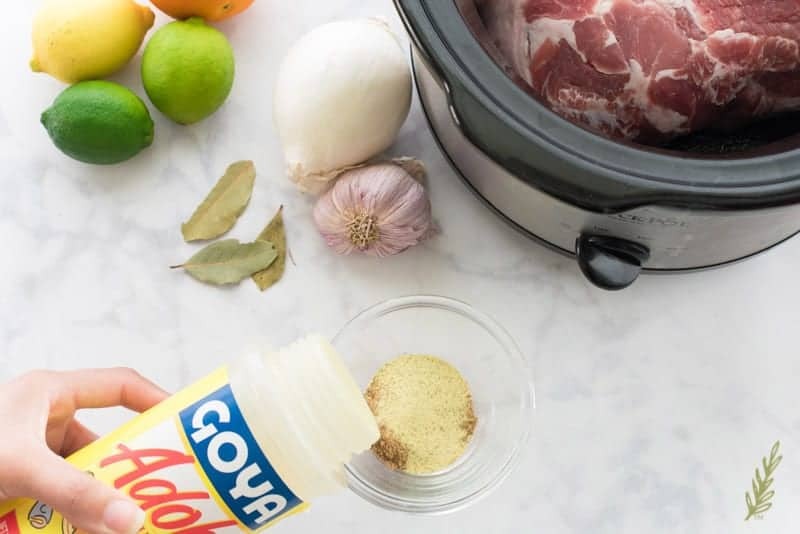 Goya is a popular brand that’s used in many Hispanic homes, but there are other brands that make both Adobo and Sazón. I trust what my mother and her mother used, though, so Goya it is. …followed by the ground black pepper. Give this mix a bit of a stir and rub it onto the entire surface of the pork shoulder. ALL of it. This is the only seasoning we’re using for this this six pound piece of meat, so we need a good amount of it to make things interesting. 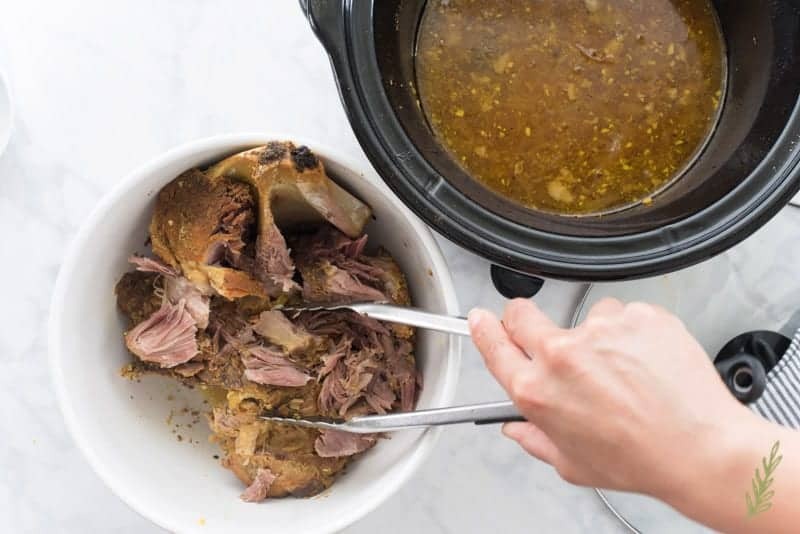 Throw your seasoned pork shoulder into the slow cooker– I mean, not literally, just gently place it in there. Add your minced garlic cloves, of which we’ve used a good amount (five cloves to be exact), because, again, flavor. Throw in two bay leaves, too. These you can THROW in, because it won’t break anything if you miss the slow cooker. Top everything with the white (read: pungent) onions you’ve peeled and sliced. Because we’re not talking about your magical mojo. We’re talking about the typically Cuban sour orange sauce, which is one of the best ways to marinate chicken, pork, seafood- even beef! While you can certainly buy the base ingredient (sour orange juice) online, I’ve found that an easier way to recreate a great mojo without involving ingredients with names like “sodium benzoate” and “sodium metabisulfate”– salt, anyone? They may be perfectly nice…things, but the fact that I had to spellcheck them three times means I’m less inclined to knowingly ingest them. How do you substitute sour orange juice? Well, first, make sure that you even have to! For all you know your grocer may carry sour oranges; but, if they don’t grab a large navel orange, one large lemon, and two medium limes. 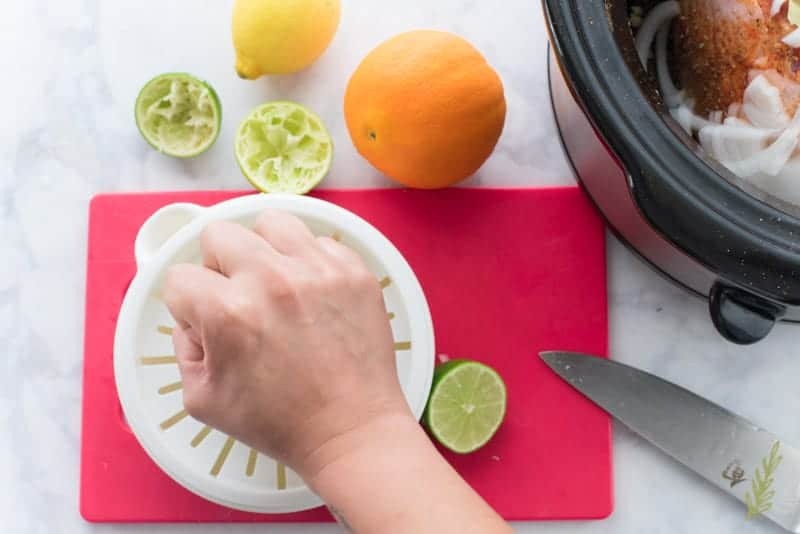 Cut all of these in half- after rolling them between your palm and the countertop to loosen those fibers and get the juices flowing- then juice them using your citrus juicer. Combine these citrus juices with some white wine vinegar for an added flavor dimension. Pour this citrus juice mixture over the seasoned pork shoulder. Place the lid on the slow cooker, turn it to low, and cook for eight hours. 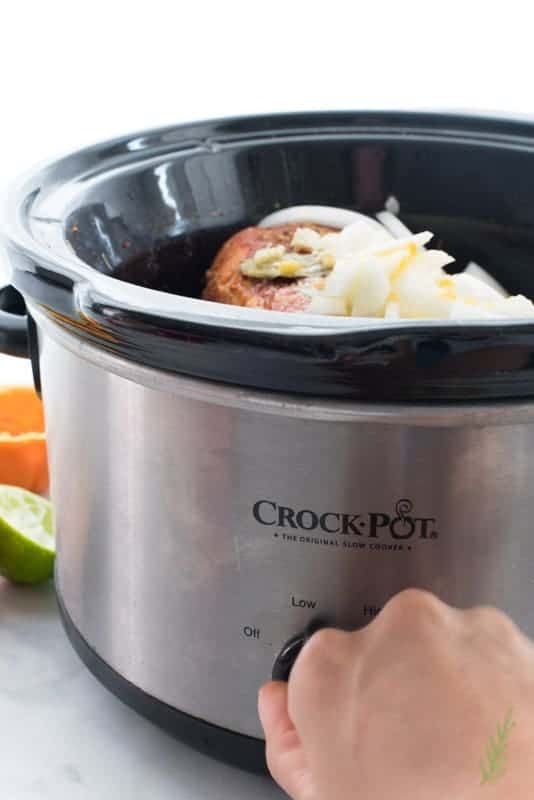 You can also crank it up to high and cook for four hours, but I prefer the longer cook time because the slow cooker pulled pork comes out fork tender, and falls off of the bone. Once the cooking time has elapsed, carefully, transfer the pork to a holding vessel- a large bowl, sheet pan, or casserole dish is recommended. Use your tongs and a large fork (if you even need it) to pull the pork from the bone. Swirl the tongs in through the juices that are left in the slow cooker to make sure no pieces of bone remain in the liquid. Also, be sure to remove those two bay leaves you threw in earlier. Discard both the leaves and the bone and set the pulled pork to the side. Using an immersion blender set to “low”, blend the liquid in the slow cooker to create a semi-thick sauce. If you don’t have an immersion blender, you can either leave the liquid as is, or carefully transfer it to a blender. Making sure to vent the blender’s lid to prevent an explosion, puree the liquid- in batches if necessary- until smooth. 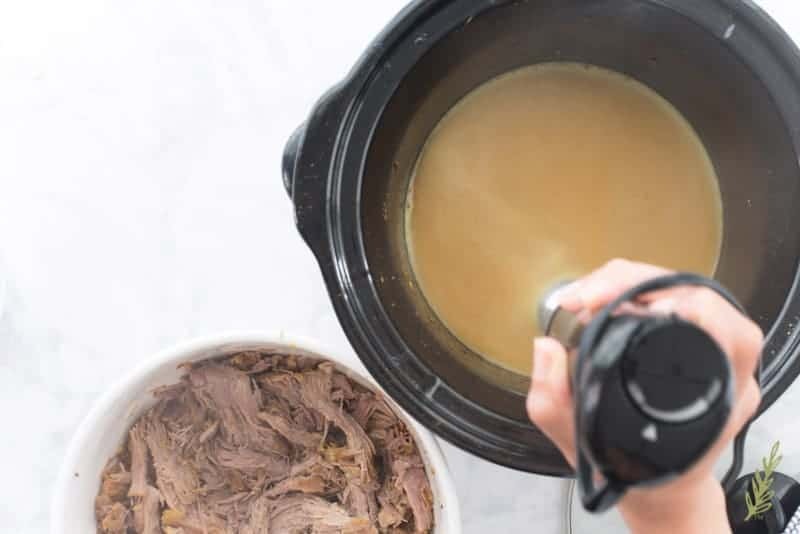 Once the cooking liquid has been blended, return the pulled pork to the slow cooker and hold it on warm until you’re ready to serve. 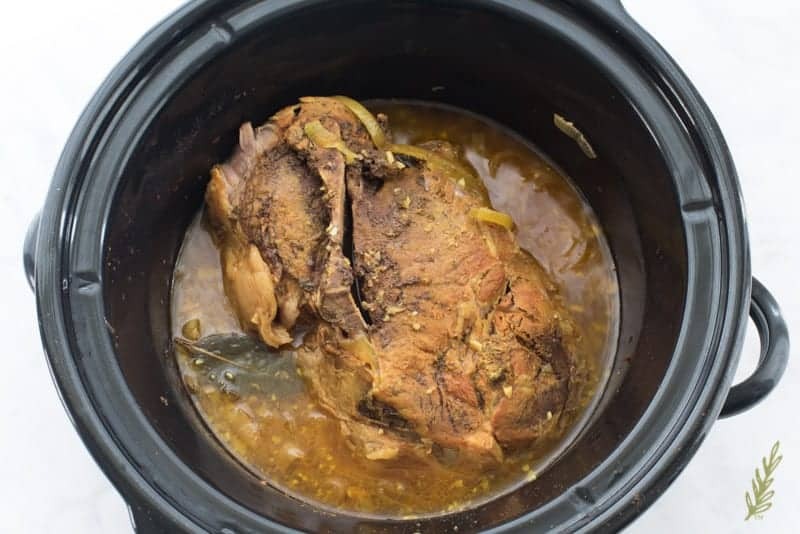 When I said this slow cooker pulled pork is versatile, I meant it. 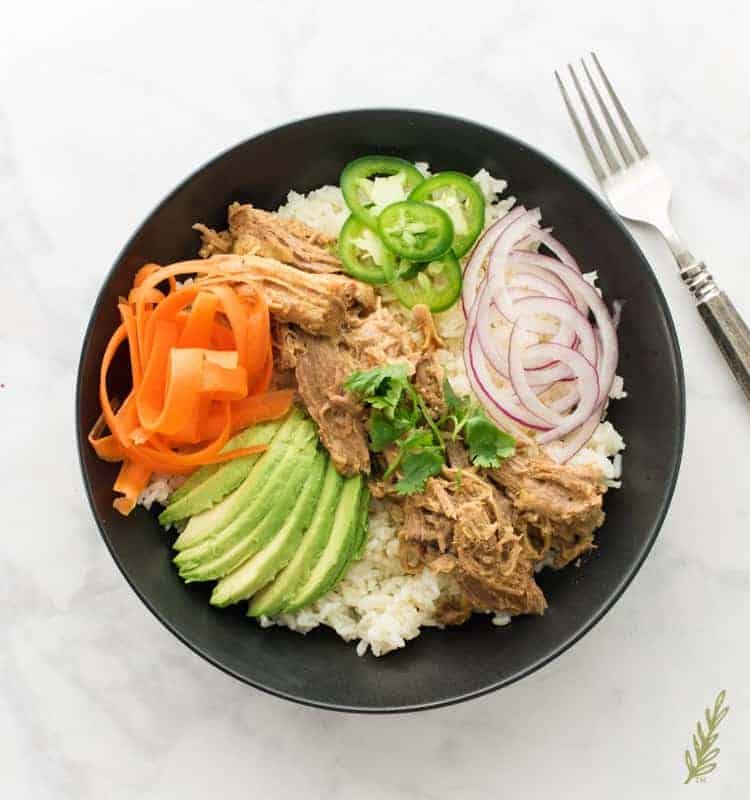 Serve this as I have, over rice with shaved carrots, ripe avocado slices, thinly sliced red onions and jalepeños, and chopped cilantro (make sure you drizzle ample amounts of that cooking liquid over the pork and rice). Or, make it taco night by filling warmed corn or flour tortillas with the pulled pork, then topping with your favorite accompaniments. Nachos, again, are another great way to serve this amazing recipe. Oh, I forgot sandwiches! Piling this slow cooker pulled pork onto potato buns, and scooping this Peruvian Coleslaw on top, is the truth! 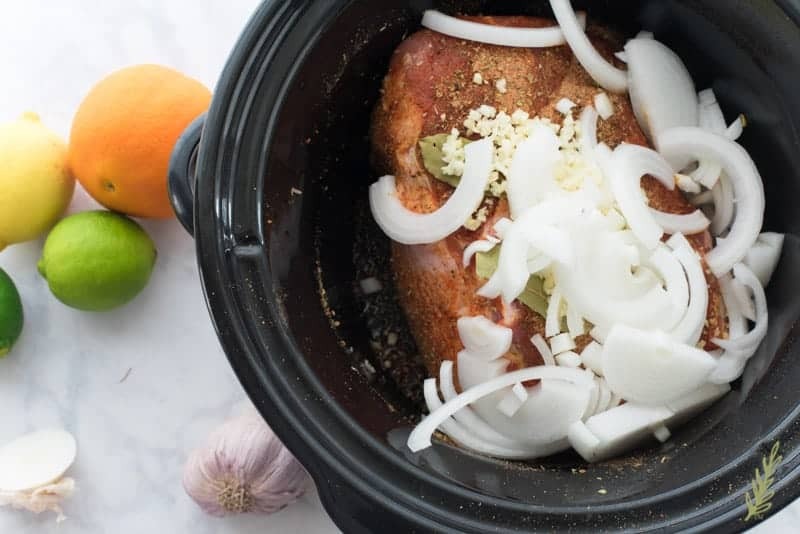 If you gave me a minute, I could probably come up with a dozen more ways to serve this slow cooker pulled pork, but I’ll let you start with these versions, first. No matter how you serve it, I know you’ll love it, so be sure to pin the recipe so you can find it easily. Oh! And don’t forget to share with your friends and family. Who knows? They may be looking for an easy weeknight recipe themselves. A great weeknight recipe, which can be transformed to complete a number of dishes. In a small prep bowl, combine the Adobo, oregano, sazón, cumin, and black pepper. Rub the spice blend onto the entire surface of the pork shoulder. 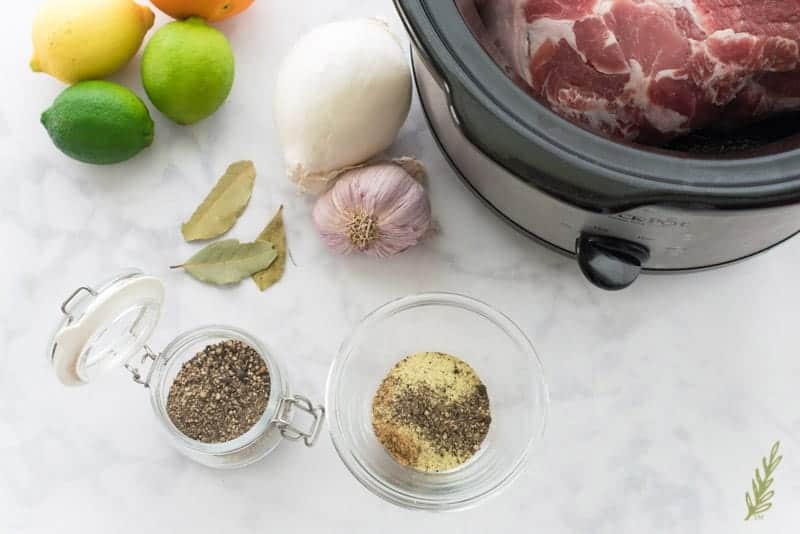 Place the seasoned pork shoulder into the slow cooker, and cover with the minced garlic, bay leaves, and onions. Mix together the citrus juices and vinegar, then pour the mixture over the seasoned pork shoulder. 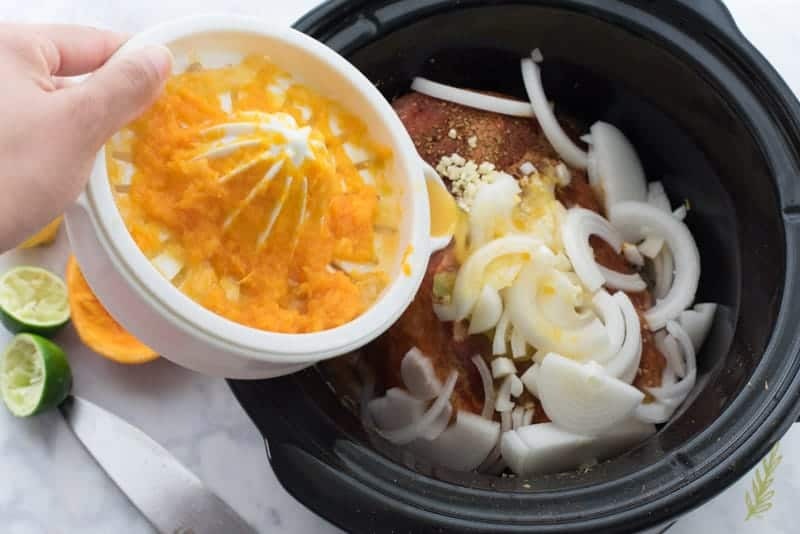 Place the lid on the slow cooker and cook, on low, for 8 hours, or on high for 4 hours. Once the pork has finished cooking, carefully, transfer the pork to a holding vessel. Use tongs and a large fork (if needed) to pull the pork from the bone. Remove and discard, both the two bay leaves, and the bone. Puree the liquid in the slow cooker using an immersion blender set to "low", until the sauce is smooth. If you don't have an immersion blender, you can leave the liquid as is, or carefully transfer it to a blender. Make sure to vent the blender's lid to prevent an explosion and puree the liquid- in batches if necessary- until smooth. Once the cooking liquid is smooth, return the pulled pork to the slow cooker to coat it in the sauce. Turn the slow cooker to warm, and cover, until you're ready to serve. 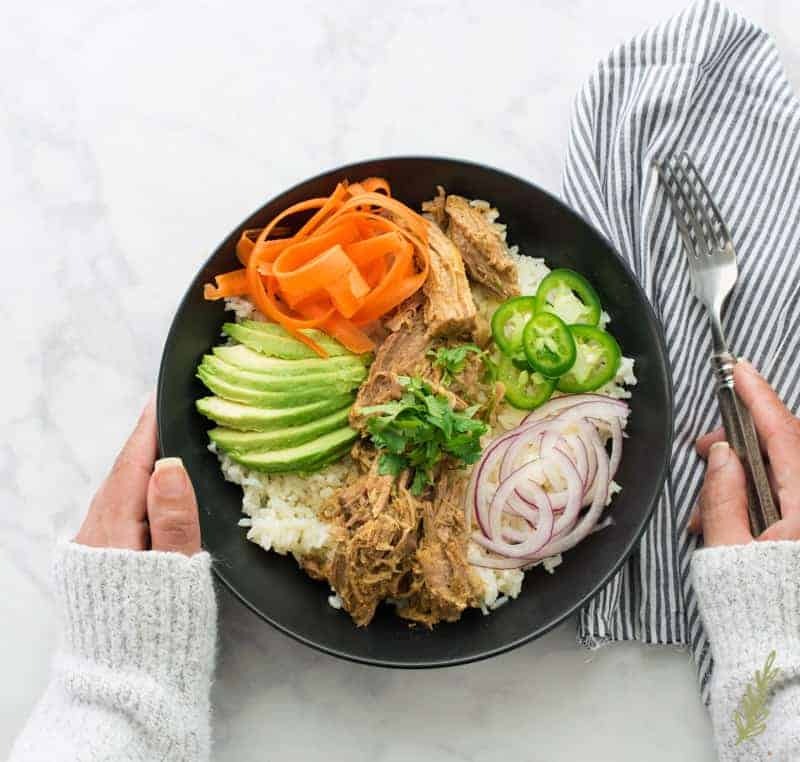 Serve the pulled pork over rice with the carrots, avocado slices, red onions and jalapeños, and chopped cilantro. Be sure to drizzle ample amounts of the mojo sauce over the pork and rice. Refrigerate covered leftovers for up to 72 hours, or freeze in food storage bags for up to 6 months. Tacos: fill warmed corn or flour tortillas with the pulled pork, top with cooked black beans, shredded Mexican cheese, sour cream, pico de gallo, gaucamole, and fresh cilantro. Nachos: spread a layer of corn tortilla chips onto a sheet pan and top with the pulled pork. Cover in shredded Mexican cheese, and refried beans and bake until the cheese has melted. Garnish with sour cream, pickled jalapeños, and black olives. Sandwiches: pile the slow cooker pulled pork onto potato buns. Top with Peruvian Coleslaw and pickled red onions. 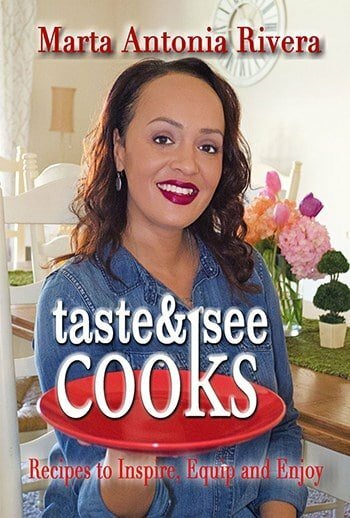 I am always looking for new slow cooker recipes. This one sounds like something that I need to try soon! I like placing dinner in the slow cooker and it being ready when I walk in the door in the evening. Don’t you just LOVE that!?! It’s like a magical robot who takes care of dinner. My husband would KILL for this! First, we LOVE pork. 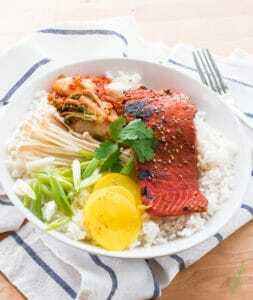 Second, that’s basically like a bibimbap dish, which is totally our jam! YUMMM! I see you know your Korean food, Rachel! 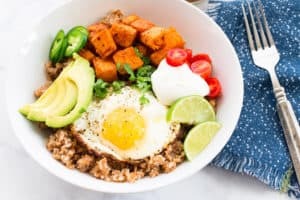 I love bowls because they’re so customizable and I don’t have to worry about serving everyone like I normally do. I call it a “Buffet”, which tricks them into thinking I want to be fancy, LOL!!!! Looks delish! This is the kind of meal I like to make, bowl and all! Yes, Julie! Makes things so easy when they can serve themselves. This looks delicious! I haven’t been using my slow cooker and I think it’s about time I use it and cook this for next week. This would be a great way to break it in!